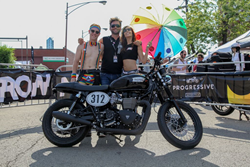 Johnny "Moto" Scheff builds a sinister, blacked-out light-custom Triumph Bonneville in 5 hours in a public motorcycle customization contest, the British Customs Iron Moto Challenge in Chicago, and crushes the competition. Three motorcycles. Three teams. Five hours. A bunch of parts. One winner. And that winner was Johnny “Moto” Scheff, the Reigning Two-Time Iron Moto Challenge Champion and Chief Mischief Officer at Motoworks in Chicago. With class and charm, Johnny Scheff, along with his teammates Mikey and Dani, built a sinister, blacked-out light-custom Triumph Bonneville from British Customs factory-spec bolt-on parts that easily won the hearts of the contest’s voters. At this year’s Motoblot, three teams from local Chicago Triumph dealers shared a single stage for the British Customs 2015 Iron Moto Challenge, where they competed to create the best-looking light-custom Triumph motorcycle in five hours using only factory-spec bolt-on parts from British Customs’ part packages. Instead of being considered full custom jobs, in which one usually has to take the bike to a garage that can chop the frame and heavily modify the motorcycle — which can be prohibitively expensive — the bikes built here are considered light-customs. Light-customs feature parts that don’t require extensive (and expensive) heavy modifications that often call for professionals with specialized tools to install, but can be built from bolt-on parts that can completely transform the motorcycle over the course of an afternoon. Each team was given a random Triumph motorcycle, straight stock out of the box. From there, they were given tools, parts, and five hours to make a custom Triumph in front of an enthusiastic crowd. The parts that made this possible were supplied by British Customs. British Customs makes factory-spec bolt-on parts that require only common tools and minimal technical knowledge to install, reviving the do-it-yourself heritage of the motorcycle community and putting the power to personalize a motorcycle back in the hands of the average rider. These packages are even ideal for dealers, because they minimize risk, install easily and quickly, and look great. The three teams were from Woodstock Triumph, Windy City Triumph, and Motorworks. Once each team had an idea of what they wanted their build to look like, they picked from various part packages supplied by British Customs. These part packages, available for purchase from British Customs, include a number of pre-selected factory-spec bolt-on parts that will completely revamp an entire system — such as bodywork, handling, or performance — on a number of Triumph motorcycles. They take the guesswork out of a making a light-custom build, as the parts in each package are designed to go together, and can all be installed over the course of an afternoon by someone with any amount of wrenching experience. Paint it all black, is what Johnny Scheff, leading the Motorworks team, thought when they received their Bonneville T100 Black. Opting for color-themed packages instead of BC’s build packages, Scheff made the winning light-custom build by curating a truly sinister-looking bike utilizing a balance of vintage and modern parts. Some parts that really pulled this build together include BC’s Black Shorty Predator Exhaust, a black exhaust wrap kit, and an Analog 3T Tail Tidy — made exclusively for British Customs by Analog Motorcycle’s Tony Prust, one of the featured builders in BC’s Pro Builder series. A brilliant, subtle build, Scheff’s light-custom easily won the contest. Johnny Scheff won last year’s Iron Moto Challenge as well — and with just as much ease — with his achingly gorgeous “Calle Maton” Speedmaster build. The Calle Maton was as clever as it was beautiful to behold, featuring an unparalleled paintjob, a fire-breathing exhaust setup, and a bolt-on rear fender bottle opener. All these factory-spec bolt-on parts featured in the Iron Moto Challenge builds are available from British Customs, and are easy-to-install, requiring only common tools and minimal technical knowledge. Become a part of the do-it-yourself movement and pay homage to the heritage of working on your own motorcycle with British Customs.